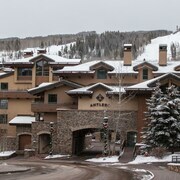 Tivoli Lodge in Vail Village sits at the base of Vail Mountain. Guests walk 5 minutes to the heated seats of Gondola One for speedy transport up the mountain to Mid-Vail. 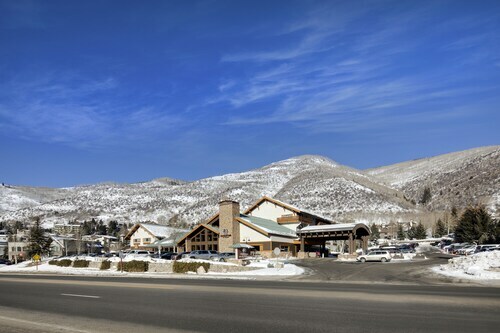 The free hotel shuttle makes it easy to get around town, which brims with bars and restaurants offering après-ski fun. 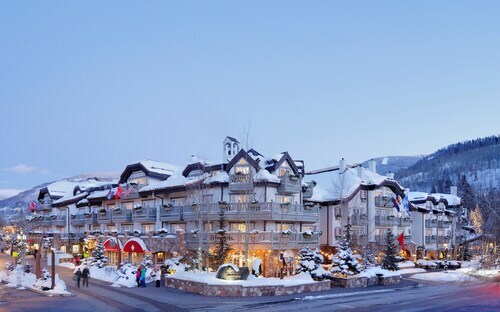 Located in the mountains, this Vail hotel offers ski-in/ski-out access within 3 mi (5 km) of Adventure Ridge, Vail Ski Resort, and Betty Ford Alpine Gardens. Cogswell Gallery and John A. Dobson Ice Arena are also within 2 mi (3 km). 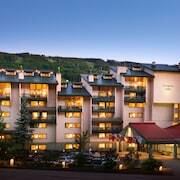 This Vail Valley lodge is just 1 shuttle stop from the Lionshead Gondola and a quarter-mile from Vail Village; complimentary shuttle service throughout the town is accessible from behind Evergreen Lodge. 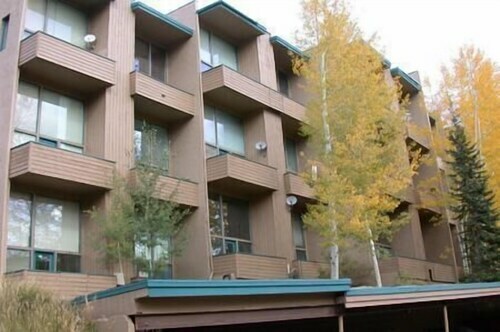 Conveniently located near the ski slopes, this Vail condo building is within 2 mi (3 km) of Adventure Ridge and Vail Ski Resort and close to winter sports such as cross-country skiing and skiing lessons. John A. Dobson Ice Arena and The Steadman Clinic are also within 1 mi (2 km). 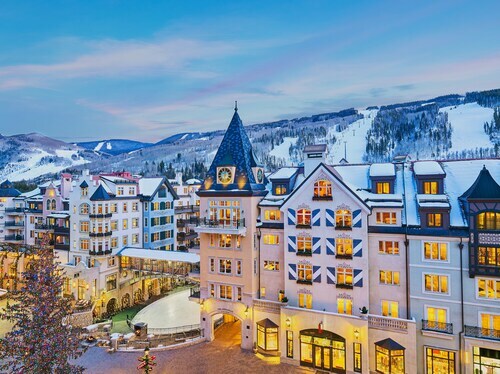 Located near the slopes, this Vail hotel is 9.8 mi (15.7 km) from Vilar Performing Arts Center and close to winter activities such as cross-country skiing and snow tubing. 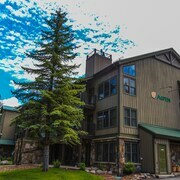 Located near the slopes, this Vail hotel is next to a golf course, within a 10-minute walk of Vail Valley Medical Center and Vail Ski Resort, and close to winter sports such as cross-country skiing and snowshoeing. Cogswell Gallery and Colorado Ski and Snowboard Museum are also within 10 minutes. 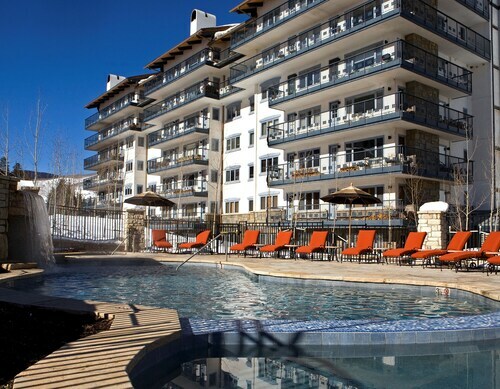 Located in the heart of Vail at Lionshead Village, this boutique property sits at the base of Vail Mountain and Ski Resort, just steps from the Eagle Bahn gondola. 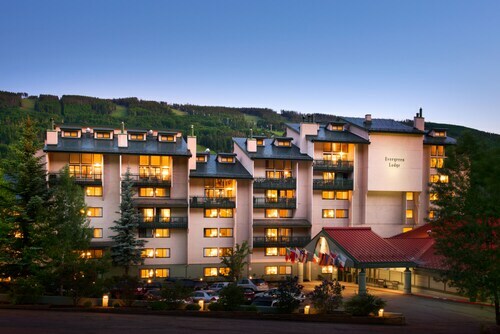 Located near the slopes, this Vail hotel is in the mountains, within 1 mi (2 km) of Vail Valley Medical Center and Vail Ski Resort, and close to winter sports such as cross-country skiing and skiing lessons. Colorado Ski and Snowboard Museum and Betty Ford Alpine Gardens are also within 2 mi (3 km). How Much is a Hotel Room in Vail? 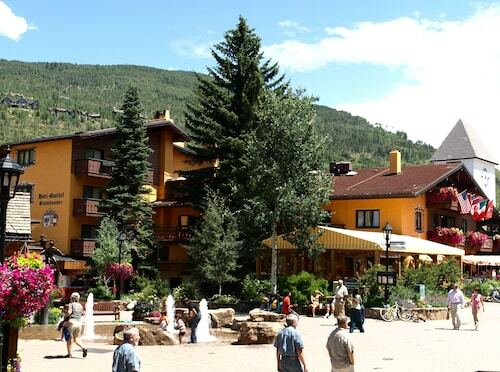 Hotels in Vail start at $119 per night. Prices and availability subject to change. Additional terms may apply. Vail ranks as one of the top winter destinations in the world. Colorado snowfalls, the largest free bus system in the country, and spectacular vistas make a cold day in the outdoors something to look forward to. 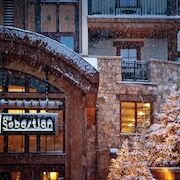 After a hard day of fun, ski hotels in Vail can pamper you with hot tubs and fireplaces. Because the town is surrounded by over 350,000 acres of national forest and filled with restaurants and boutiques, you can also visit it any time of year. 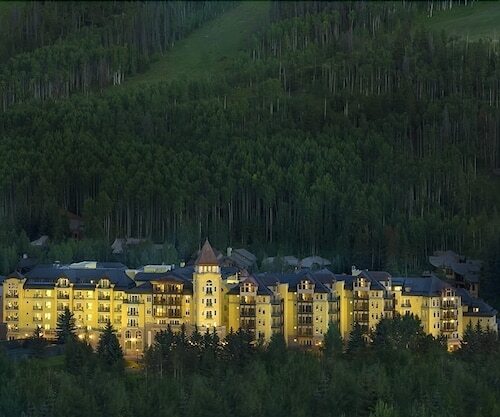 As a bonus, coming during the summer months grants you relatively cheap accommodations at even the best Vail resorts. Whether you dream of skiing through a winter wonderland or hiking among summer wildflowers, journey to Vail, a European-inspired mountain village in Colorado’s White River National Forest. No stranger to luxury, Vail has long been a ski resort town that attracts world-class athletes and solace-seeking travelers alike. Inspire your inner expeditioner looking over the slopes and walking trails surrounding Eagles Nest, or snuggle by a warm hearth with a good book and a view of majestic Bald Mountain. Whatever your mountainside style may be, you’ll find the best Vail hotels for your getaway right here. If you’re traveling by plane, you’ll likely arrive at Denver International Airport. Take this opportunity to savor the 125-mile drive through the Rocky Mountains. Pack your camera and keep your eyes wide for the commute of a lifetime. Once you reach your pick of hotels in Vail, relax in a low-key, small-town atmosphere, or stretch your legs and sense of wonder at the world-famous Vail Mountain Resort recreation area. 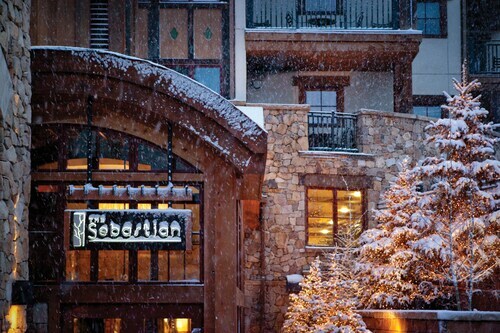 Located near Vail’s city center, The Sebastian and the Vail Marriott Mountain Resort are two guest favorites, offering exquisite full-spa offerings and breathtaking chalet décor—the perfect reward after a long, invigorating day spent in the great outdoors. Race down the slopes in Vail's 5,000+ acres for skiing. In the summer, hike or bike into forests or up mountains, navigating numerous scenic trails. In addition, melting snow fuels thrilling runs through rapids on the Eagle and Colorado Rivers. It’s time to turn your daydreams into a reality. Fill your lungs with fresh air and dust off your skis—or take your first lesson—in the Centennial State. With Travelocity, you’ll find a cheap Vail hotel that’s low on price and high on comfort, thanks to our price-matching promise. We’ll offer the best deal on an amazing hotel, or we’ll make up the difference if you find it somewhere else. It’s that simple—like watching the sunrise over the mountains. Amazing room, staff and location. Already planning to spend our Christmas here! 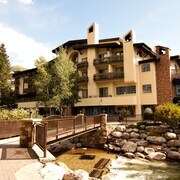 Great location in Lionshead Village in Vail, which is about a 2 min walk to the Gondola for skiing. The ski valet takes your skis down for you so all you have to do in the morning is wander over and ski. There was a local beer tasting when we checked in, and the shuttle took us over to dinner at a nearby restaurant. There was live music in the lobby bar in the evening (Sat evening). The staff and valets were friendly, warm, welcoming, and had good tips for where to go and eat. I would stay here again in a heartbeat when I’m in Vail. The hotel was nicely renovated and felt welcoming. Location was great and especially liked the free shuttle into the village. Enjoyed the live music in the lobby each night and also getting massages at the Simply Massage located conveniently in the hotel. 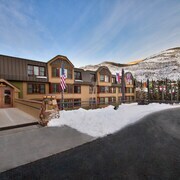 Overall a great place to stay when exploring Vail! Best place to stay in Vail. 1 block from Gondola, great restaurant and bar. 6 months ago by A verified traveler from Lafayette, La.